"My college experience has been so positive that I’ve already recommended the professional construction course to other people." Derby College professional construction student Sam Gilleard cannot wait to start his new surveying job when he finishes his course next summer. Sam who is 17 and from Alvaston, has a job lined up with Armsons in Derby – and the chance to study for a degree in quantity surveying and commercial and construction management. 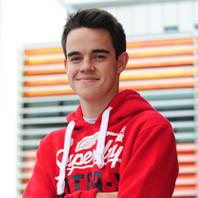 Supported by his employer, Sam will take the degree part-time at Nottingham Trent University. Armsons offered Sam the job after he impressed them during a four-week internship in the first year of his BTEC level 3 course. Sam, whose dad works as a builder, thoroughly enjoyed his work experience and got the chance to go out on site with surveyors as well as do CAD drawings and measuring. He also loves his time at Derby College and is keen to share his rewarding experience with other prospective professional construction students.